This is the 4th of 6 quilts that I'm sharing as part of a series this summer/fall, which explores ways to quilt modern, more minimalistic quilts (than what I usually make). To read a detailed introduction to the blog series, click here. Quilts featured so far: Electrify, Intersection, and Building Blocks. Happy fall! While the last two quilts of the series are a bit more autumnal/wintery, I still have to share this summery project here. 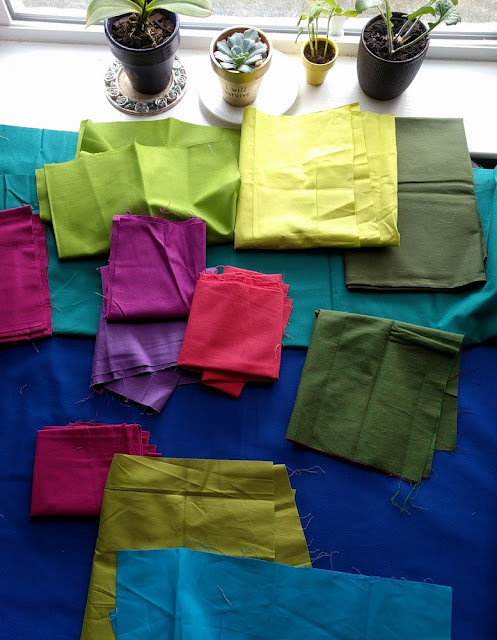 This unconventionally-colored baby quilt was an exciting one for me in my exploration of sewing solely with solids (say THAT four times fast). 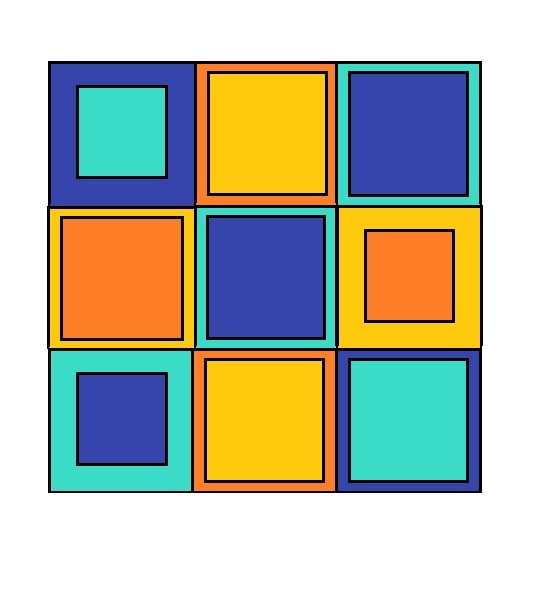 I started making it based on the simple idea of two squares changing size and four very bright, bold colors. Northcott had the exact shades I was looking for in their Colorworks Premium Solids. My favorite is that lovely royal blue, which I also used for the binding and backing (see pictures further down this post). My affinity for solid fabrics and their infinite combinations has proven to be a catalyst for pre-thinking (a lot) about the actual quilting. 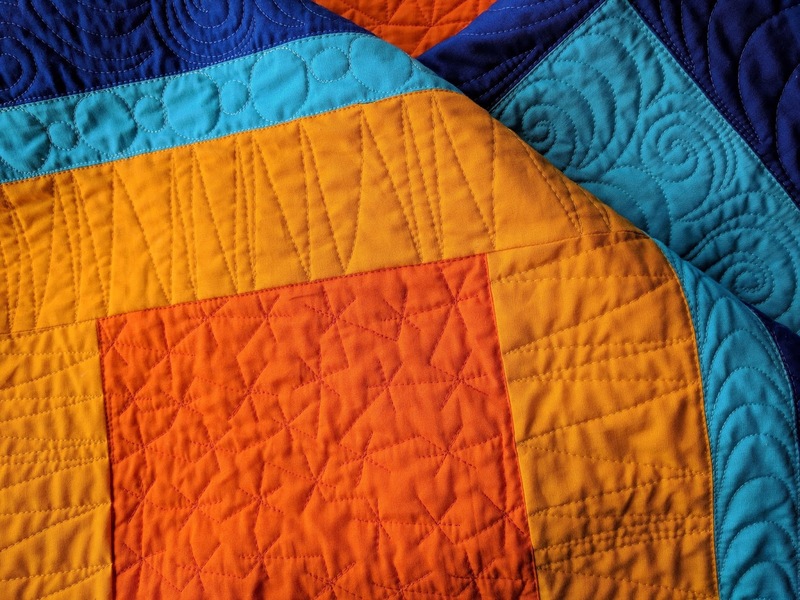 I decided to quilt the blues in curves (swirls, braids, pebbles, and the like) and the oranges/yellows in angles (tessellated triangles, zigzags, and lines). I think it gives some order to the quilt, whether the observer realizes it or not! Plus, it was just pleasing to quilt in this way. I used Aurifil Threads, in slightly lighter shades, to quilt up these soft fabrics. 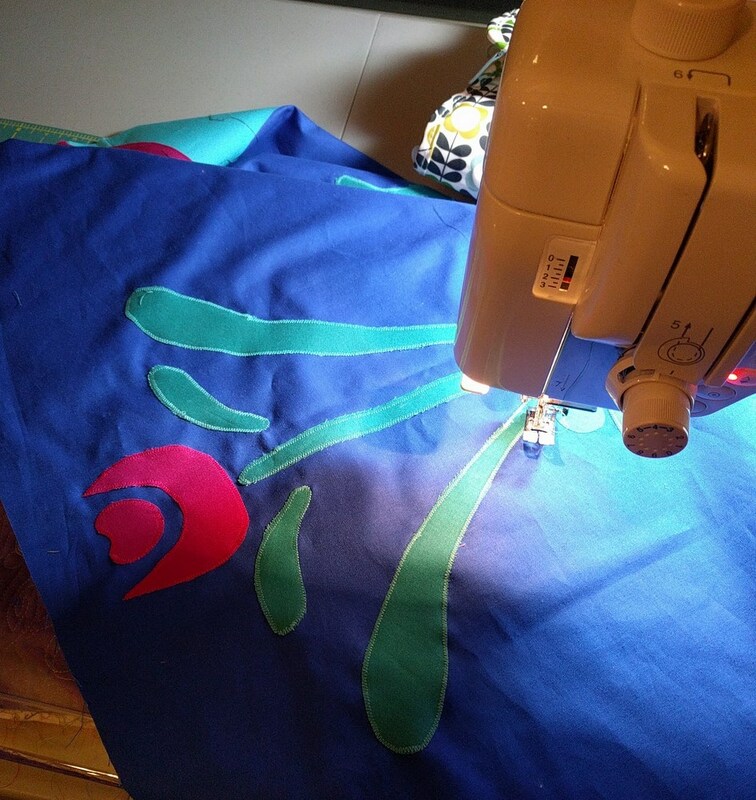 I want all of my hard quilting work to show up, not hide in the fabrics! 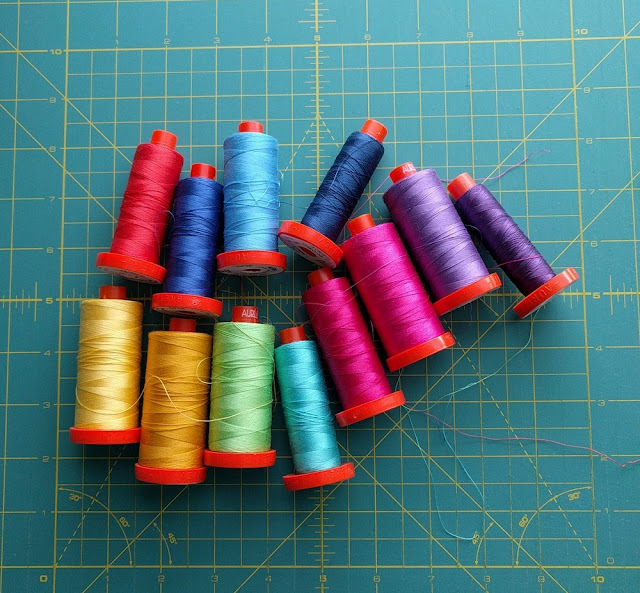 :) Though, the great thing about quilting with solids is that no matter what thread shade, you'll always get LOTS of texture. 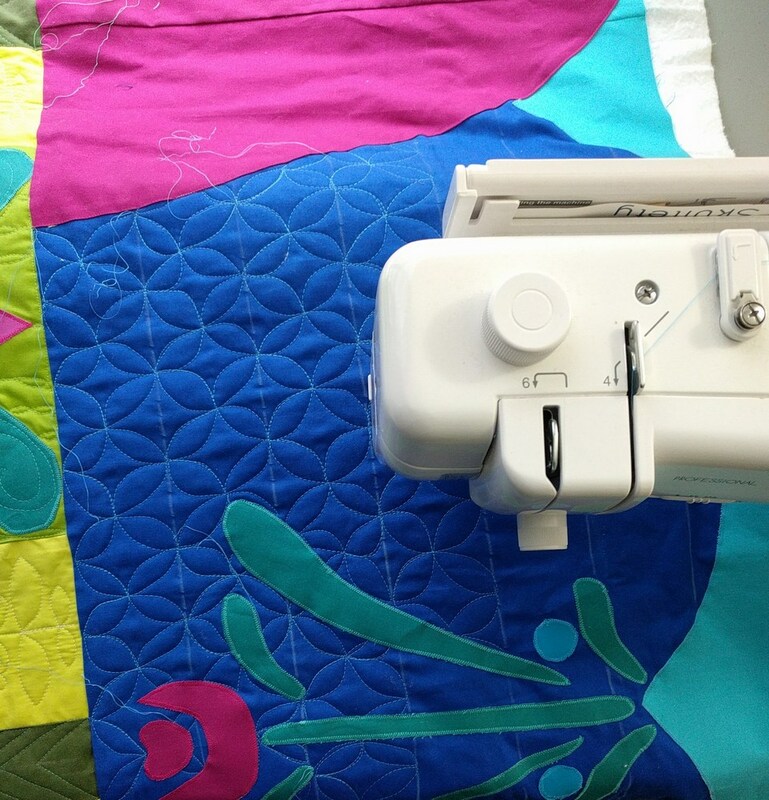 So, just remember - quilting modern quilts doesn't have to be confusing or difficult. Find a way to organize it for yourself and go from there! At lectures, I've presented this quilt as a basic example of a minimalist log cabin quilt (at least, how a log cabin can be put together). It's a pattern that requires just a beginner level of quilting expertise; I'm certainly not the first to make a quilt with just squares and borders. The best part about this: you can really bring it to life with quilting if you so choose ("quilt it to life" not "quilt it to death!"). As a baby quilt, it definitely has a lot of potential and fluff. Believe it or not, the quilting doesn't make it too stiff. And since the backing is all in solid, just LOOK at how the quilting shows up! I love!! 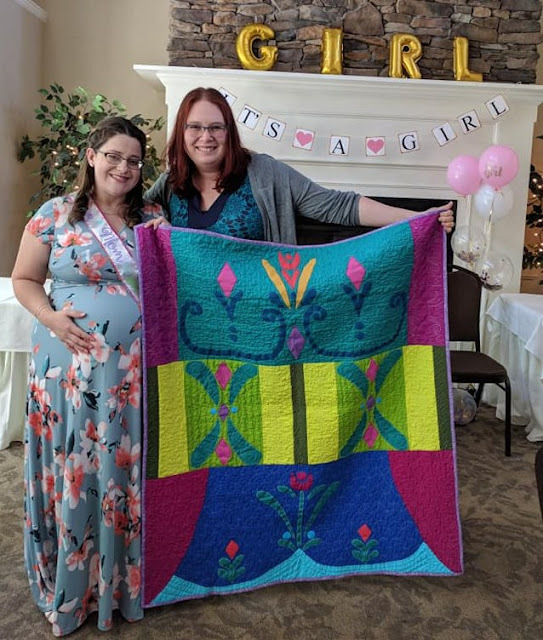 And with that, I hope this quilt ends up with a baby who perhaps has a bit of a modern take on life (we're not talking pastel blues and pinks here, people. Not that there's anything wrong with that, but hey, there are lots of options! :) Like bright purple. Just saying). Thank you so much to Northcott Fabrics for sponsoring the fabric, The Warm Company for Warm and Natural batting, and Aurifil Thread for the 50 weight threads. All opinions about materials are my own, honest ones. I'm so happy to share the second of three super meaningful quilts I made over the summer! It gave me SO much joy to find out that one of my oldest, closest friends was expecting her first baby (plus, this is the first of my friends to have a baby, so cue the excitement). Throughout my teens, this was that one friend that I talked with excitedly about growing up together, bringing our babies in carriers as we potentially meet up for coffee in 15 years' time. 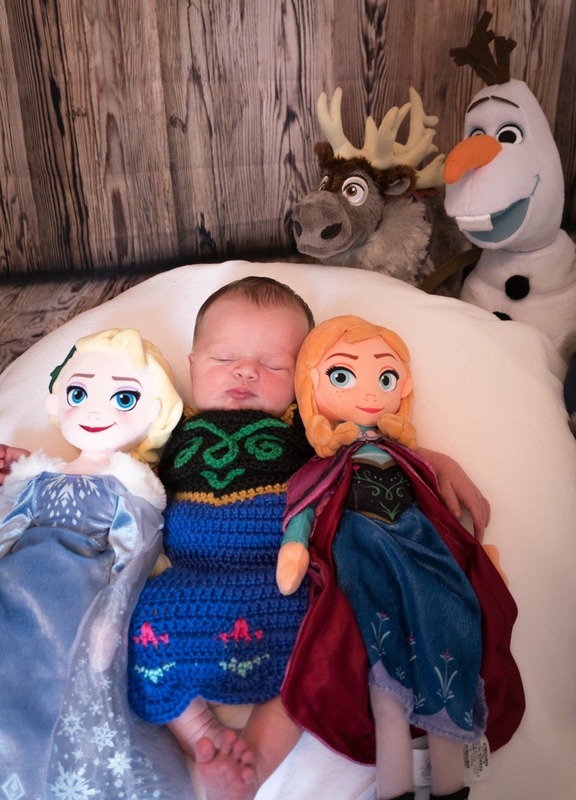 Once we had squealed about the pregnancy for quite a while, Julie revealed her plans for a Frozen-themed nursery. She was thinking about asking me to make a quilt based on a picture that I have actually already made a quilt from (she didn't know!!). I told her it would be difficult to do on a larger scale, so she gave me free reign to come up with a Frozen-inspired design. I was secretly happy because I don't typically make quilts twice, and free reign is invigorating. And then it hit me, pretty quickly. 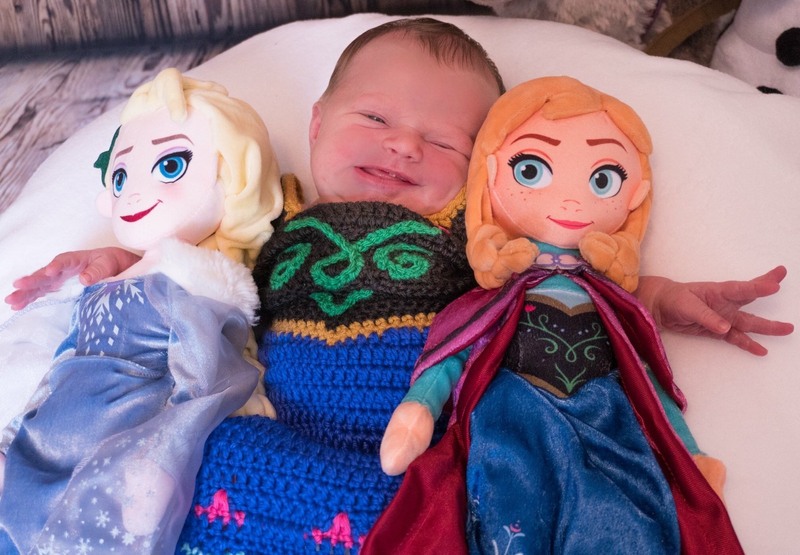 Like one of Elsa's icy blasts. 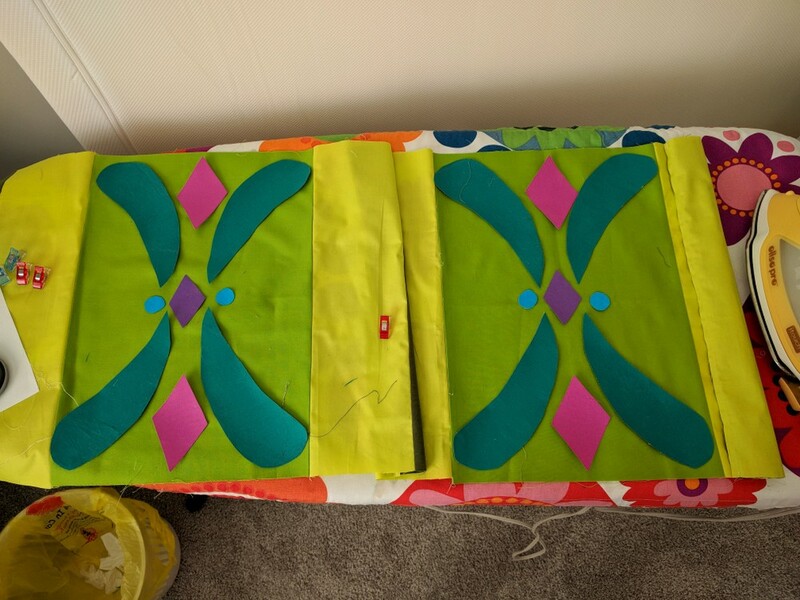 Why not make a quilt based on three of the gorgeous, ornate, brightly-colored dresses from the movie? Here are some good pictures of the three actual dresses: here, here, and here. The pinks in the top and bottom quilt panels serve as the capes that accompany those two particular ones. I hopped on Pinterest right away, pinning all kinds of ideas for "rosemaling," which is traditional Norwegian design - usually very flowery, repetitive, and literally on nearly ever surface in the movie (don't forget to come back here and read the rest of this post [there are baby pics at the end!] after you've jumped down that spellbinding Pinterest black hole). Back when the movie first came out on DVD, I sat and doodled motifs spotted on doors, across fireplaces, and on windows. So I used those doodles as a reference, too. Great job, Disney. Recreating the dresses took quite a bit of sleuthing. It was really difficult to find detailed pictures of the designs from the movie itself, believe it or not. 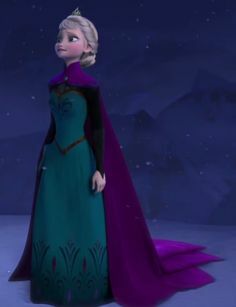 In screenshots, there are so many closeups and moving dresses! So I estimated and made it my own. 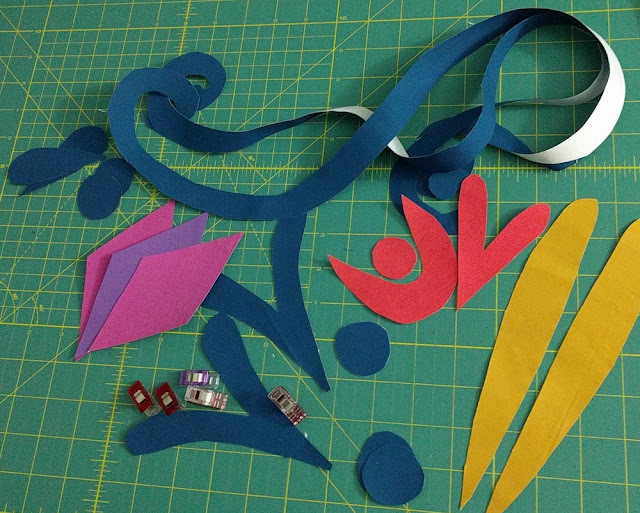 After hand drawing and cutting out all the pieces, I adhered them to Heat-n-Bond Lite, which I then adhered to three pre-pieced panels. The best part about this quilt was that it was entirely stash-made; I didn't have to buy any particular colors. I just stretched out what I had and substituted where necessary, and it worked out splendidly. It's in those moments that I'm glad I have a fabric and scrap stash. After about 4 hours of closely zig-zag stitching all the pieces down (thank goodness for quilt retreats - that made me get it done! ), I excitedly moved onto the basting and quilting phase. This was a great opportunity to quilt in some of the beautiful Scandinavian motifs I had been ogling at for months. Thanks to my friend Jess for encouraging me to really quilt up those backgrounds. For a while I thought about simple quilting (me?!? Simple quilting?) just to let the appliqued designs show off. I definitely would have regretted that. For the back, I sewed together some pretty Anna Maria Horner fabrics that harmonized well together. Some of these prints felt Scandinavian to me, too. It was so exciting to present the quilt to July at her baby shower, and now, baby A is here to enjoy it, too! I'm so happy to finally share this quilt with the world! I'm sure I'll never make anything quite like this again. It was a really special experience.